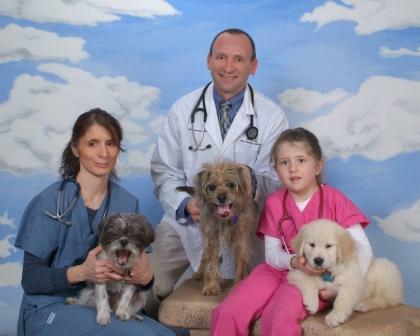 Dr. Hammes and his wife, Toni, own Buffalo Alta Animal Hospital. They have a daughter named Grace. In addition to all of the pets that they see at the hospital and consider part of the family, they have three dogs at home: Bodie, a Border Terrier; Jack, a Brussels Griffon/Shih Tzu mix; and Archie, a Golden Retriever. Dr. Hammes is a graduate of Iowa State University’s College of Veterinary Medicine. He is licensed to practice veterinary medicine in Nevada as well as California. He has been in Las Vegas since 2003. Prior to that, he was in Northern California for around 10 years. Dr. Hammes personal philosophy is that your pets should be treated the way that he wishes his pets to be treated – by kind and caring staff who have the best interest of your pets first in mind. Toni is a Licensed Veterinary Technician and has been working in the veterinary field for many years. She attended CSN where she obtained her formal training. Toni has always loved animals and feels fortunate to be able to help them everyday. Grace is the daughter of Dr. Hammes and Toni. She is eleven years old, and already considers herself an expert on all animals, big and small. Dr. Hammes and Toni feel that it is very important to teach children to love, and respect all animals. When not in school, Grace enjoys volleyball as well as helping around the hospital. At home, Grace helps to take care of all of the dogs, including feeding, brushing, and helping Mom give them their monthly heartworm, and flea & tick preventatives. Grace is in the process of training Archie to be a therapy dog. Dr. Hammes and all of his staff went the extra mile to try and save my little Sophie. She was treated with love, care, and was given the beDr. Hammes and his wife, Toni, own Buffalo Alta Animal Hospital. They have a daughter named Grace. In addition to all of the pets that they see at the hospital and consider part of the family, they have three dogs at home: Bodie, a Border Terrier; Jack, a Brussels Griffon/Shih Tzu mix; and Archie, a Golden Retriever. Toni is a Licensed Veterinary Technician and has been working in the veterinary field for 13 years. She attended CSN where she obtained her formal training. Toni has always loved animals and feels fortunate to be able to help them everyday. Grace is the daughter of Dr. Hammes and Toni. She is seven years old, and already considers herself an expert on all animals, big and small. Dr. Hammes and Toni feel that it is very important to teach children to love, and respect all animals. When not in school, Grace enjoys gymnastics as well as helping around the hospital. At home, Grace helps to take care of all of the dogs, including feeding, brushing, and helping Mom give them their monthly heartworm, and flea & tick preventatives. Grace is in the process of training Archie to be a therapy dog. Best medical attention possible! Not only did they care about Sophie, but showed that same care towards me as well. I would highly recommend anyone who wants the best for their pet to experience what I did with the professional and personal care of Dr. Hammes and his staff at Alta Buffalo Hospital. A special thank you to Toni and Alice. They truly do care about your babies as much as you do! There are no words to express the gratitude in my heart for all you did. Our experience with the Buffalo Alta Animal Hospital has been great. They are kind, efficient and reasonable on prices. The doctor is great and listens to our concerns. We have not had a bad experience there. We were thrilled to have our breeder refer us to Dr. Brian Hammes and his staff. Each and every one of them are so very caring, not only to our puppy and her needs, but to us as well. The cost is very reasonable, and the care that you will receive is beyond any expectations you may have.I will highly recommend Dr. Hammes to anyone looking for the utmost professional, yet highly personal care for your pet and yourself!